MOSCOW, Russia, December 20, 2013 (ENS) – The Russian parliament has formally adopted an amnesty measure that will end legal proceedings against the Greenpeace Arctic 30. The Russian lawmakers Wednesday voted for an amendment that extends a broader amnesty decree to defendants charged with hooliganism. It therefore includes the Arctic 30 – the 28 activists and two freelance journalists who were arrested following a protest at a Gazprom-operated Arctic oil platform in the Pechora Sea on September 18. 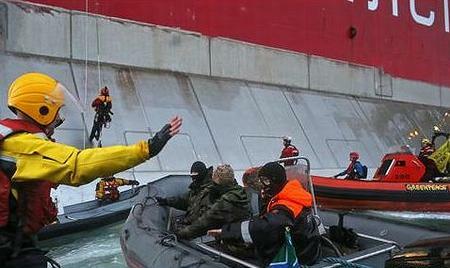 Greenpeace activist, left, puts his hands up as Russian Coast Guard officers, center masked, disrupt the action. Another Greenpeacer hangs from a rope thrown upon the Gazprom drilling rig, September 18, 2013. (Photo courtesy Greenpeace). Several of the Greenpeace activists attempted to scale the oil platform to dramatize their contention that oil extraction in Arctic waters risks spills that would be impossible to clean up, and burning the fossil fuel would accelerate climate change. Originally also charged with piracy, that charge against the Arctic 30 was dropped by Russian prosecutors. A ruling in November by the International Tribunal for the Law of the Sea ordered Russia to allow the Arctic 30 to leave the country immediately and to release the Greenpeace ship Arctic Sunrise, as soon as a bond of 3.6 million euros in the form of a bank guarantee was paid. That bond was posted by the Government of the Netherlands – where the Arctic Sunrise is registered – on November 29. The ship is still in Russian hands and Russia is now in defiance of that order. While the Arctic 30 were in prison, first in Murmansk and later in St. Petersburg, Gazprom was not idle. Today the Russian oil giant announced it has produced the first commercial quantities of oil from its Arctic drilling platform Prirazlomnaya in the remote waters of the Pechora Sea. 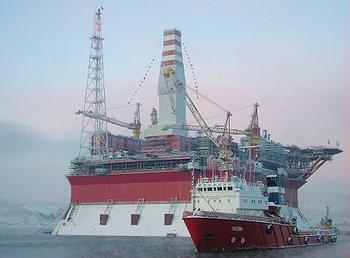 Oil production at Prirazlomnaya is the first commercial oil extraction from the Arctic shelf anywhere in the world. The Prirazlomnaya platform was the focus of the Greenpeace protest in September which led to the arrest and imprisonment of the Arctic 30. In response, Greenpeace said that the “clock is ticking” on a major environmental accident in the Arctic region. “The timing of this announcement is intriguing, to say the least. When Gazprom called the authorities and instructed them to arrest us, they never bargained for the global outrage they sparked. Now we are going home and Gazprom is licking its wounds,” said Oulahsen. “Announcing they have started producing oil does not dissuade us, it makes us more determined than ever to grow this global movement to save the Arctic. We’ve already discovered more oil than we’ll ever need if we’re going to avoid dangerous climate change. Looking for more of the stuff in the beautiful fragile Arctic is an act of extreme folly,” she said. To realize its goal of opening up more of the Arctic to oil exploration, which Russia aims to turn into its “resource base of the 21st century,” Gazprom has signed an exploration deal with Shell that will provide it with new capital and much-needed expertise in offshore drilling, even though Shell’s own 2012 attempts to drill in the Alaskan Arctic were marked by a series of repeated accidents and embarrassing safety blunders. Yet this deal represents a huge financial and reputational risk for Shell and its investors. A recent report written by Greenpeace, Share Action and Platform examined at the risks posed by Shell’s deal with Gazprom. It concluded that the partnership may expose Shell and its investors to risks associated with the Russian firm’s poor record on safety, environment and transparency.